Coordinators with permission to edit helpers can set a default alert date for each helper, or set alert dates per position for each helper. 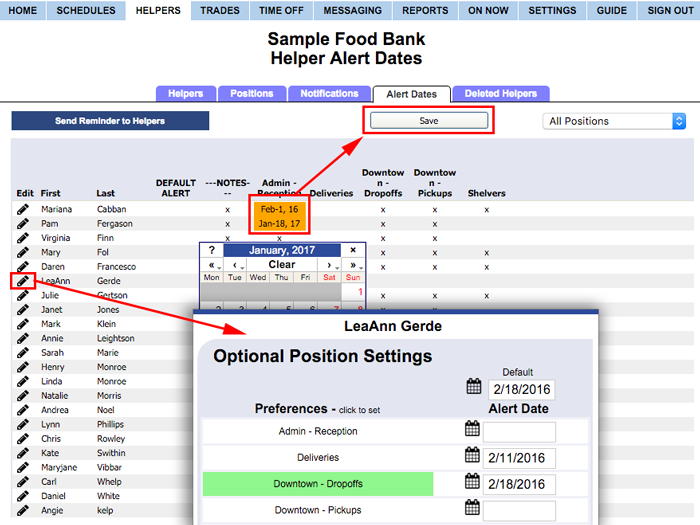 Alert dates can be used any time you want to be alerted about a helper when they are scheduled past a certain date. They can be used, for example, for certification dates to show you in advance if a helper is scheduled past their certification expiration date. Alert dates do not prevent the helper from being scheduled, nor can helpers see these dates when they sign in, but you can see the helper name highlighted in red on the By Helper and Availability schedule view, the Shift Change page, and on their Helper Details page if their alert date has passed. You also will see a warning on your coordinator homepage if any helpers have an alert date in the next 30 days. You also can send helpers alert date reminders, ex. send a note to all helpers with an alert date in the next month or three months, etc.